As I sit here with my baby girl one thought comes to mind... HOW is she so big already?! Tears flowing. I have realized with this little baby being my second the real necessities needed to make my days a bit easier. I tend to ride the minimalism wave so for me there are just a few things I find extra helpful. It was my absolute pleasure to partner with some of these companies to share with you the products that I love and have made this second time momming thing a bit easier on myself. I never leave the house without it. It is THE best 360 nursing coverage that has 100 versatile uses... well maybe not 100, but it's pretty darn close. I use it as a nursing cover for my baby when we are out and about. It's great because I know that I am covered all the way around and can do exactly what I need to do under the cover to ensure my baby latches well and gets all the milk she desires. I also use it very often as a car seat cover when we are out of the house. She has always taken better naps when she can't see what's going on around her so that comes in super handy when I am at CrossFit at nap time. This little pillow came in super handy in those first few weeks home. Fynn was so tiny and when I say tiny I mean she was like THE littlest peanut and I used this to help me hold her body in place for nursing. 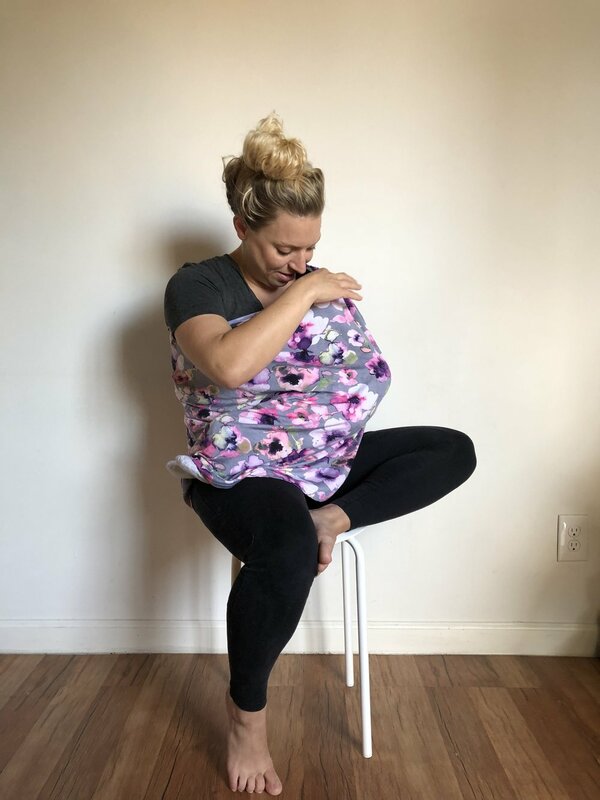 For many women, including myself, nursing is difficult in those early days so having a pillow designed to elevate baby to the right height helps tremendously. Fynn loves using it as a lounger as well. Her smile in the picture below says it all. I also cannot wait to use this when she is a bit older to prop her up on tummy. There are so many great versatile uses that it's definitely worth having on hand. I think I found my favorite mom item! Let's be real... as a mom of TWO you NEED room to carry everything from burp cloths to an extra pair of little boy undies to nursing pads to water and don't forget the monster trucks and little snuggie. I love the Parker Baby brand too. Created for moms by a mom of almost FOUR. So she knows a thing or two about creating a product that works and is super beautiful. The diaper bag has plenty of pockets and places to store things. Everything has a place, which is great! And it somehow with everything I have in it, it doesn't feel heavy on by back, whatsoever. It distributes the weight well and allows my hands to be free chasing my kids. I just wish I knew about this when I had my son. This product is every nursing moms dream. I've heard of milk savers which I know work for some women, but the great feature on this milk saver is that it suctions to the breast to collect even more of the letdown. I have never used an electric pump with Fynn and I have lots of milk stored up in the freezer just from using this. I would totally recommend it for all new moms. Fynn Rose, strength and peace is found in you sweet girl.